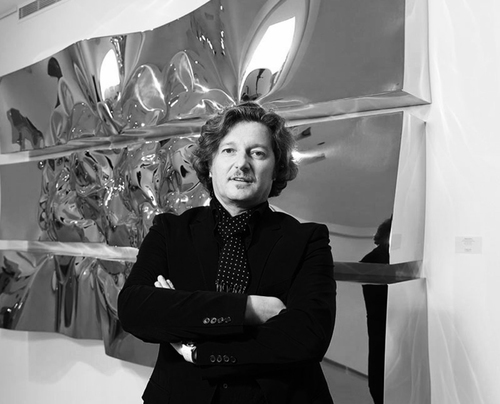 Helidon Xhixha was born in Durrës, Albania, in December 1970. Raised into a family of artists, Xhixha inherited his respect for the Fine Arts and passion for sculpting from his father. While waiting to begin his studies at the Academy of Arts in Tirana, he decided to move to Italy where he attended the Brera Art Academy of Milan. Awarded a scholarship in 1998, he attended the London’s Kingston University where he developed his techniques of engraving, sculpting and photography. Graduating from the Brera Academy in February 1999 he quickly became renown in the academic art sphere for his unique style. His creations included works in Murano Glass and sculptures in stainless steel using innovative and specialized techniques. Helidon Xhixha represent a turning point in the international art scene where he continues to thrive and hold a prestigious role on many levels. (Italy, Germany, Switzerland, France, England, Austria, Spain, Principality of Monaco, America, Brazil, Albania, Dubai). Stainless steel is the base of all of Xhixha’s sculptures. Using steel as a tool to manipulate light, rather than the sole medium of the work. The reflective nature of the work gives it an inherent site-specific dependency, the sculptures utilize their environment to capture and transform the surrounding colors and shapes, giving them a dynamic and energetic quality. Xhixha embraces the idea of the monument, the works are presented as strong, physical objects, but rejects the rhetoric usually associated with such a style; emphasizing instead the interplay between steel, light and the environment. Porto Cervo (Italy) - Helidon Xhixha: "Color and Matter", in collaboration with Pied à Terre Contemporary Art and Contini Art UK. Thunder Light, St. Regis Bal Harbour, Miami, Florida. Everlasting, La Porta di Milano, Terminal 1, Malpensa Airport, Italy. Waterfalls, Giuseppe Bussolin Square, Padua, Italy. Riflessi Lunari, Helsinn Healthcare SA, Pazzallo, Switzerland. Lighted Runways, Terminal 1, Malpernsa Airport, Milan, Italy. Iceberg, Venice Biennale, San Servolo Island, Venice, Italy. The Four Elements, Venice Biennale, San Servolo Island, Venice, Italy. Pillars of Light, Venice Biennale, San Servolo Island, Venice, Italy. Mantegazza, Palazzo Mantegazza, Riva Paradiso, Lugano, Switzerland. Oceano, Muse Sunny Isles Sales Gallery, Sunny Isles Beach, Florida. Vela, New Yacht Club de Monaco, Quai Louise II, Monaco. Seahorse, Saint Jean Cap Ferrat, Côte d’Azur, France. Monolite d’Acciaio, National Museum of Science and Technology “Leonardo da Vinci”, Milan, Italy. The Wall, Bayfront Park, Miami, Florida. Riflessi di Storia, Presidential Palace, Tirana, Albania. Suono d’acciaio, The Violin and contemporary Art Museum, Stradivari Foundation, Cremona, Italy. Riflessi dal Cielo, Lombardy Regional Government Building, Milan, Italy. Light Collision, Lombardy Regional Government Building, Milan, Italy. Elliptical Light, Grand Hotel Melia, Port Rashid, Dubai, UAE. Renaissance of Towers, Piazza IV Novembre, Legnano, Italy. The Coil, Arvedi Steel Plant, Via Acquaviva 18, Zona Porto Canale, Cremona, Italy. Renaissance of Towers, Provincial Authorities Building, Via Torquato Tasso, Bergamo, Italy. Steel and Kauri, Riva 1920, The Museum of Wood, Via Milano 110, Cantu, Italy. Renaissance of Towers, Piazza Alessandro Volta, Como, Italy. Renaissance of Towers, Piazza Vigili del Fuoco, Milan, Italy. Renaissance of Towers, STARK The transformer Station Umbolt, Copenhagener Strasse, Berlin, Germany. Renaissance of Towers, Piazza de’ Rucellai, Florence, Italy. The three monoliths, Montanstahl Factory, Via Gerrette, Stabio, Switzerland. Monumental sculptures, Piazza Santa Maria Novella, Florence, Italy. Renaissance of Towers, Cornice Venice, International Art fair, Venice, Italy. Airone, Piazza Magnani Ricotti, Novara, Italy. Testa di Cavallo, Piazza El Alamein, Novara, Italy. Light and Shade, Gemine Muse(2nd edition), Young Artists in Italian Museums, Novara, Italy. Cavallino Rampante, Ferrari Factory, Maranello, Italy. Renaissance of Towers, Corso Umberto I, Stresa (Vb), Italy. Bas-relief, Piazza Marinone, San Pietro Mosezzo (No), Italy. Horses, Piazza Martiri della Libertà, Banca Popolare di Intra, Novara, Italy.